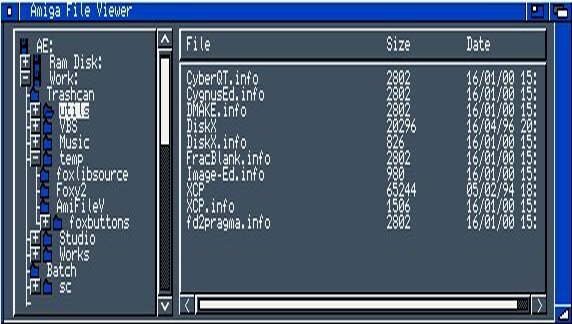 What is Amiga File Viewer? If you know Windows Explorer for the PC then you'll find Amiga File Viewer instantly familier. AFV allows you to view, move, delete and run files all from one easy to use application. Your available drives are shown in a pane on the left of the application and each can be expanded to show the directories. Each directory can then be expanded to show the sub-directories beneath it etc. Clicking on a drive or directory shows it's contents in the right hand pane. Double-clicking on any file in the right hand pane will launch the default program for that file type (configurable). For example, you may use ViewTek to view images. If so, you could set your default application for files ending .jpg and .jpeg to ViewTek. Then when you double click on a jpeg image, AFV will launch ViewTek and show you the image. AFV is so simple to use and so useful that you'll wonder how you ever managed without it. Download it here (94k). Note: AFV requires FoxGui version 5.0 or greater.